But viewers seem to unanimously agree on the awesomeness of the event’s human JumboTron, in which 70,800 people in the audience were “turned… into pixels,” as The Wall Street Journal put it. If you tuned in (or caught the live stream) to watch the show, you might have wondered how the audience didn’t look like an audience at all. Instead, they resembled what seemed to be the largest TV screen ever, projecting light patterns that even portrayed Queen Elizabeth and Michelle Obama. Organizers pulled it off by providing each member of the audience with a ten-inch electronic paddle wired to a central computer and outfitted with nine full-color LCD squares. Not only did audience members participate in broadcasting images of a '60s go-go dancer, a train in London's Underground, and a representation of the birth of the Internet, they also danced with the paddles to create a twinkling effect that put to shame the old-school practice of holding up lighters during a performance. Behind the scenes of the show, workers had laid hundreds of miles of cables behind stadium seats to connect the waterproof paddles, which were attached to a recyclable plastic holder on the back of each seat. In addition, during the show technicians had hundreds of backup paddles on hand in case any used by the audience burned out or malfunctioned. The genesis of the new technology came in 2010 when Frederic Opsomer, CEO of Tate Technologies—the company that made the LCD paddles—told the London Organizing Committee he could put a screen anywhere. Later the opening ceremony team, led by British film director and producer Danny Boyle, asked Opsomer if he could turn the audience into a screen. Tait Technologies now calls the technology “Landscape video” and says each of its handheld video tablets can be individually programmed and viewed at 180 degrees both horizontally and vertically. In 14 weeks, 50 designers from digital media company Crystal GG created the animated images for the show, working at a secret London office where they used extra air conditioners to cool computer processors. Crystal says it received requests for additional content until the last minute before the show. 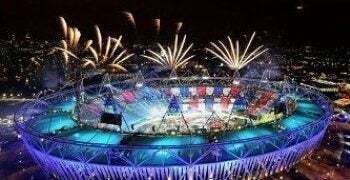 According to The Journal, the London 2012 opening show cost $42 million to produce. Whether or not you feel the show was worth it, you can’t deny that pixelating an audience is an impressive feat. (See also "10 Great Apps for the London 2012 Olympics").